A retreat amongst the fun, beautiful, luxury condo with pool, awesome location. bed sheets, pillows and pillow cases provided. dishes, utensil, kitchenware, wine opener. serves 10. Loved it! Beautiful place, well stocked with kitchen stuff and cleaning stuff. Loved it so much that I have already booked it for next year! It is a beautiful condo, in a great location and well stocked with kitchen supplies and cleaning items. 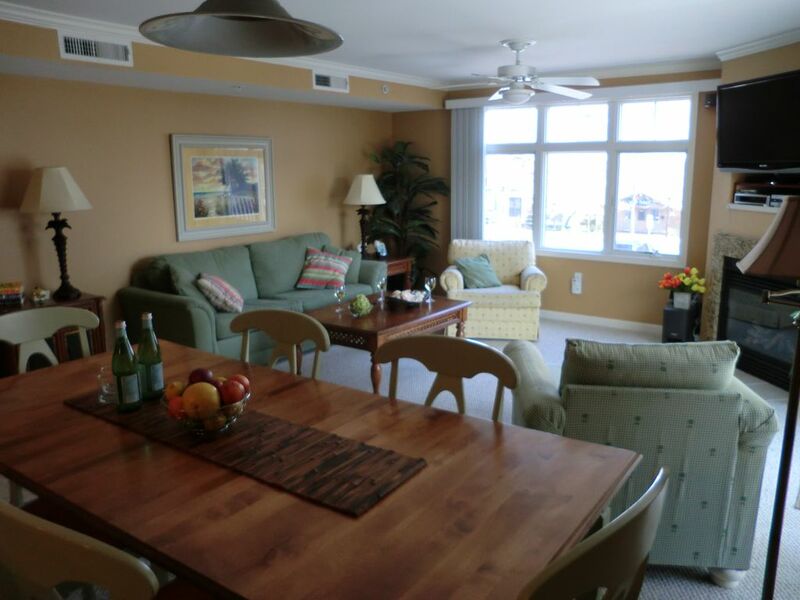 This condo is centrally located and has everything you need for your stay at the beach. There are tons of sheets, towels and beach supplies. The condo is directly across from the pool which is very convenient. We took our children and our two nine month old grandchildren and the babies had so much room to crawl it was wonderful. Any supply you needed to cook with or item you needed for the beach was there for your use. Joy was very easy to deal with and even brought to my attenion a light fixture that wasn't as she expected it to be, it took me all week to realize what light she was talking about. We will definitely stay at Joy's condo again! We had a family of 9 stay here. It was perfect and a perfect location. Steps away from the beach & boardwalk. 2 blocks from the bay. Walkable restaurants and fishing trips. They had the condo well supplied with extras such as beach stuff and linens. One of the best places I have stayed at. Everything was clean ,spacious and perfect for our family vacation. Pool was wonderful and right outside the door. Plenty of places to sleep our family of 9. Great views and walking distance to boards and ocean. Was a wonderful location to everything. Bay and Beach and Boards. We love to watch the fireworks and all the rides lite up, from the front window and balcony. Going back next year. Owner was great and so nice. Our family couldn't have a better condo for our week in Ocean City. It was literally in the middle of everything...boardwalk, beach, food, shopping, etc. The condo itself was spacious, great layout, and had more amenities than we could use. We're already talking about booking it again for our next trip. The owners were kind and helpful, and the pool put this place over the top! If I had 1 negative, it was that we had to change 6 light bulbs during the first part of our stay...otherwise, perfect. We loved returning this year. The place is convenient to everything in Ocean City. It is great for the seniors like me and my husband, and also for the grandkids. One of my favorite things is the pool right outside the condo. I would definitely do it again.